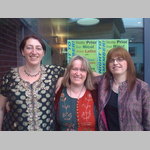 The Bailey Sisters are a trio comprising Shelley Rainey, Karen Dyson & Aly Rainey and have been performing since 2009. Karen plays guitar and Aly fiddle but the trio are particularly known for their acapella singing. They perform songs ranging from 13th Century to the present day including some of their own compositions. Come and give them a warm welcome at the Diamond.